Subaru infused the 2018 WRX STI with Alcantara. Gone are the days of cheap Subaru interiors. 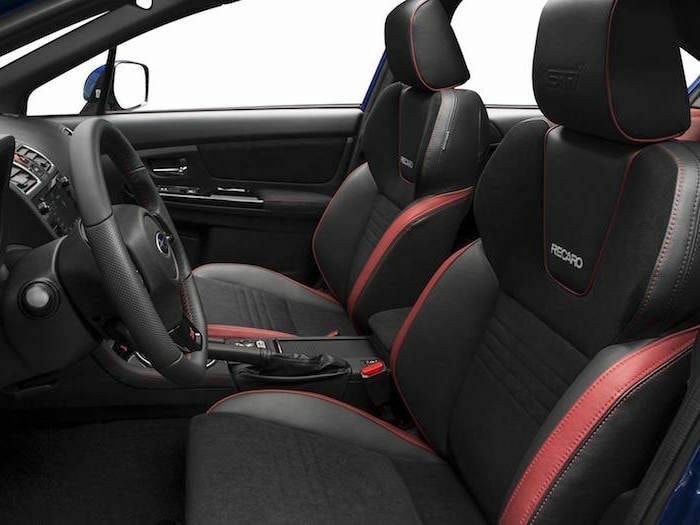 The Subaru WRX STI has come a long way with its interiors. Remember when Subaru interiors were the weak point for all their cars? Well the brand has come a long way since they had more hard plastic inside than anything else. The WRX STI interior materials were cheap and the fit and finish was poor. Those days have changed with the introduction of Alcantara. You’ve heard the name Alcantara, and that Subaru uses the material on their newest 2018 WRX STI, but who are they? Standard on the the 2018 WRX STI Limited, and available on the base STI, Subaru enhanced the performance-tuned WRX STI with Recaro seats with grey Alcantara on seat centers, steering wheel and a darker grey Alcantara with red contrast stitching on its door panels. It definitely took the quality up a few notches over the outgoing model. We found it to be true, when we drove the 2018 STI last summer. Alcantara is a unique Italian-made material that offers designers a variety of benefits, including extreme versatility in terms of grip, breathability, resistance to wear, light fastness and clean-ability. Alcantara maintains compliance with the strictest industry standards for technical performance. The lightweight, carbon-neutral material is a preferred choice for many of the world's luxury and high-performance automakers. Alcantara’s headquarters are located in Milan, Italy with research and production facilities in Nera Montoro, Umbria. Other automakers who use Alcantara are Lexus in their LC 500, Audi RS 3 Sedan, Alfa Romeo trimmed it in its Giulia Quadrifoglio and Stelvio Quadrifoglio SUV, and Dodge uses it in the Challenger R/T, Charger SRT Hemi, and Challenger GT Plus. Subaru also took measures to improve the noise level in the cabin of the new STI. New features include thicker door glass, revised door sealing and a foam-filled windshield header beam. Subaru cabins have long been known for their sparse and cheap interiors but things are changing. The 2018 Subaru WRX STI gets infused with some extra luxury from Italy.